Last year, I shared the most depressing PowerPoint slide in Danish history. Back in 2011, I wrote about a depressing picture of tax complexity in America. Let’s continue with the “depressing” theme today. James Bessen, from Boston University Law School, has an interesting article in the Harvard Business Review about the source of corporate profits in the 21st century (h/t: James Pethokoukis). He starts with an observation and a query. Profits are up. …is it good news for society? The default answer presumably is yes. Higher profits, after all, generally are a sign of wise investments. And when labor and capital are allocated wisely, that’s good news for consumers and workers. But Bessen correctly observes that profits can increase for bad reasons, and that’s the focus of his research. …the rise in profits might represent a decline in…economic dynamism. …Firms engage in political “rent seeking”—lobbying for regulations that provide them sheltered markets—rather than competing on innovation. If so, then high profits portend diminished productivity growth. …In a new research paper, I tease apart the factors associated with the growth in corporate valuations. Unfortunately, he finds that cronyist policies account for a depressingly large share of corporate profits. I find that investments in conventional capital assets like machinery and spending on R&D together account for a substantial part of the rise in valuations and profits, especially during the 1990s. However, since 2000, political activity and regulation account for a surprisingly large share of the increase. Here’s a very grim chart from his article. At the very least, I’ll call this the most depressing image of 2016. Ugh, what a dismal observation on the state of our economy. Companies are almost making as much money from manipulating Washington as they earn from serving consumers. Heck, just consider the way politically connected financial institutions tilt the playing field for unearned goodies. 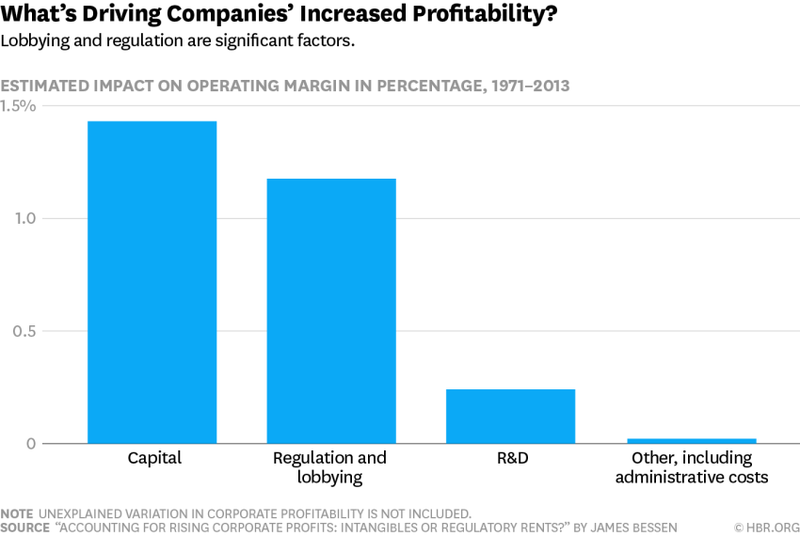 Bessen adds some analysis, including the very important insight that regulation and intervention tends to help big companies relative to small companies and new competitors. Much of this result is driven by the role of regulation… Lobbying and political campaign spending can result in favorable regulatory changes, and several studies find the returns to these investments can be quite large. For example, one study finds that for each dollar spent lobbying for a tax break, firms received returns in excess of $220. …regulations that impose costs might raise profits indirectly, since costs to incumbents are also entry barriers for prospective entrants. For example, one study found that pollution regulations served to reduce entry of new firms into some manufacturing industries. It’s also worth noting that he finds that this bad news really started back in 2000, which makes sense given that both Bush and Obama have pushed policies that have expanded the clumsy footprint of government. This research supports the view that political rent seeking is responsible for a significant portion of the rise in profits. Firms influence the legislative and regulatory process and they engage in a wide range of activity to profit from regulatory changes, with significant success. …while political rent seeking is nothing new, the outsize effect of political rent seeking on profits and firm values is a recent development, largely occurring since 2000. Over the last 15 years, political campaign spending by firm PACs has increased more than thirtyfold and the Regdata index of regulation has increased by nearly 50% for public firms. What an awful cycle. Government gets bigger and more powerful, which lures companies into viewing Washington as a profit center, which then leads to more policies that expand the size and power of the federal government, which leads to further opportunities for rent-seeking behavior. Lather, rinse, repeat. Oh, and don’t forget this is one of the reasons why there’s a revolving door of insiders who shift back and forth between the private sector and government, but their real job is always to be working the system to obtain undeserved wealth. Which is why I periodically explain that there’s a big difference between being pro-market and being pro-business. P.S. Earlier this year, I shared some data, based on sources of billionaire wealth, that suggested that cronyism wasn’t a major factor in the United States. But Bessen’s new research nonetheless shows we do have a major problem, perhaps because people who get rich honestly then decide to maintain their wealth dishonestly. P.P.S. If there’s any sort of silver lining to this bad news, it’s this amusing parody commercial about Kronies, which are toys for the children of Washington’s gilded class.